Looking for a healthy snack to serve at your Superbowl Party, your next Taco Tuesday, or simply a “go-to” to keep in your fridge? 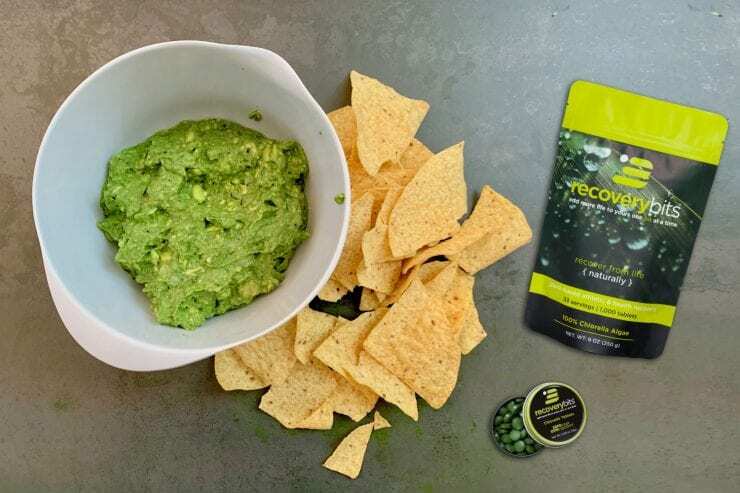 Chlorella guacamole is your answer. With RECOVERYbits® chlorella tablets, we are upgrading your favorite green dip with an even cleaner and greener superfood – chlorella. With over 40 vitamins and nutrients, chlorella is the perfect detoxifying agent to add to your diet. It has one calorie, one ingredient, zero sugar, and pairs perfectly with other plant foods (like avocados)! Cut avocados in half lengthwise, take pits out. Scoop avocados into mixing bowl, set aside. Cut onion in half, set one half aside. Dice half of the onion. Set aside. Spread RECOVERYbits® tablets onto clean surface and crush with the back of a spoon or a rolling pin. If available, use food processor to crush tablets. Scoop up powder into a small bowl. Using a large fork or potato masher, mash up the avocados. Add the diced onions and mix with a spatula. Add the RECOVERYbits® chlorella and mix with a spatula. Add lime juice and mix with a spatula. Enjoy with your favorite tortilla chips or veggies! Check Out a Video of Our Recipe Here!